Must be a minion thread above my pay grade. Oh! You’re right I tagged you on the other post but it was in the private minion category. Sorry about that! Seriously, thanks for the quick feedback on all this. I think this update may have broke the WC app a bit. It now constantly says it’s had to close due to errors, also all the icons have a box with a X inside them. So it looks like they are not able to find their icons. @ady624 does the app need to be updated to except the new FA5 update? Yes, the dashboard update requires an update to the same version of the smart apps. iOS app works perfectly. Still wish they’d add some features to it but just thankful it’s available. Hard refresh to get the changes ASAP otherwise the dashboard will be updated with these minor fixes automatically after a day or so. @ipaterson, I just did a hard refresh of my browser, and now my drag and drop arrows are gone!! Which web browser is this? My Firefox is a tad old (v52.0 - 64bit) so I can keep using certain plugins. The performance trade-off is so huge here that I’m hesitant to revert back to the normal way of rendering those with Font Awesome for old browsers. I’m double-checking other browsers to make sure this only affects old versions, but for this one particular icon I can do a different kind of fix rather than trying to use the options available in Font Awesome. Very strange, it works fine in all the major browsers I can find but since 52 is a long term support version of Firefox it’s not unreasonable to require support for it. I installed 52 and see the same as you. You can click and drag the right half of that gray column where the icon should be as a temporary workaround. Ahh, I see what’s happening here. This isn’t a case of Firefox not supporting the feature that Font Awesome is using, but rather combined with something else that webCoRE uses it does not work. So the optimization is to make a single icon on the page and then just reference it everywhere it needs to appear, but older versions of Firefox require that reference to include the entire URL path. So rather than the code <use xlink:href="#drag-handle"></use> I need <use xlink:href="/piston/:abcabcabcabcd24e17efe32a168bc37:#drag-handle"></use>. I’ll just have to find a convenient way to do that! This will hold me over until a solution is found… Thanks for taking the time!! @WCmore, try a hard refresh on the dashboard, those icons should work now in Firefox 52. The fix described above worked and was implemented in a way that is flexible enough to support other icons in case further optimization is needed elsewhere. Yee Ha! it works like a champ!! Speaking of Firefox, do you know why the header and footer text on the dashboard tiles do not consistently shrink to fit the tile as it does on other browsers? 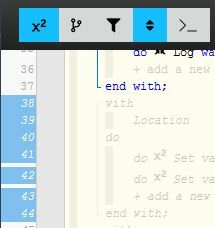 On Firefox, tiles often display with an ellipses and missing text, as below. It’s been this way as long as I remember. That’s odd, would you please post that as a separate bug report? Another bug fix went out today, piston snapshots were showing a lot of blank space at the top with the bottom of the piston cropped off. Please hard refresh the dashboard if you are affected by the snapshot issue. This was caused by the Font Awesome optimizations earlier this week since I placed the reused icon symbol in an unfortunate location that caused it to affect the snapshot.